This is the front for the ruffled tank that’s still a WIP. 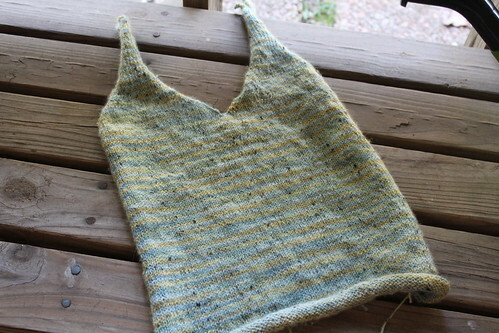 I knitted the back and while congratulating myself, noticed that it looked a little “wonky”. It was then that I noticed the huge mistake I made. When a pattern states “work as for front” it means just what it says, start at the top of the pattern, not in the middle. So, I frogged the entire back and started it again, this time paying more attention. Sigh. That’s why it’s recommended that you read a pattern through multiple times BEFORE you start knitting. Another sigh.